Our Products >> .50-90 Sharps, New, 450 Grain Lead, One Cartridge Not a Box. One Cartridge not a box unless you by 20 cartridges which will be in the box. 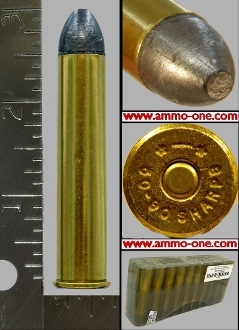 One Cartridge not a box: .50-90 Sharps, new production by PCI using new Starline Brass with “ *∩*50-90 SHARPS” Head-Stamp and loaded with a 450 grain Lead projectile. May have minor nicks due to the loading process, the price reflexes this minor issue. The 50-90 Sharps was introduced in 1872 to answer the high demand for a more powerful caliber in the "long gone" old Buffalo hunting days. The 50-90- 2&1/2" (50cal, 90 grains of Black Powder) offered more power then the 50-70 Sharps. Sharps also offered 50-100 and 50-110 in 2&1/2" long cartridge cases. .50-90 Sharps, New, 450 Grain Lead, One Cartridge Not a Box.